It’s been a long week and you’re ready to taste some tequila. 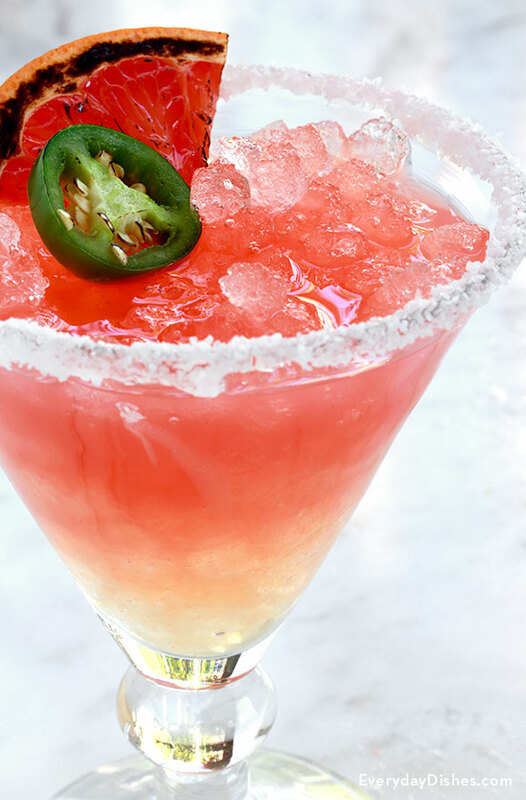 You deserve a cocktail that has as much pizzazz as you do—get ready to kick back a spicy grapefruit margarita with jalapeño! Dial up your salty senoritas and tell them to bring an ingredient—and maybe some snacks—bada bing, it’s a party! The prep is easy—after you muddle the jalapeño, simply combine all the liquid ingredients, give the cocktail shaker a good rattle then you and your best pals are on to sipping this magical margarita juice. For an extra icy treat, put your cocktail shaker in the freezer beforehand. You can adjust this recipe to make it a little more mellow or add a little more oomph, but a word of caution—after one or two of these bad boys, someone’s likely going to be dancing on the table. Drink responsibly! Rinse cocktail glass and place in the freezer to chill. Add jalapeño to an empty cocktail shaker then ambitiously bruise the flesh of the pepper using a wooden spoon. Leave the muddled jalapeño in the shaker then fill with ice. Add the liquids then cover and shake vigorously. Remove chilled glass from the freezer and salt the rim, if desired. Fill the glass with fresh ice then strain margarita into the glass. Garnish with a fresh lime wedge or even a small slice of jalapeño. Enjoy! For a less spicy version of this drink, wash the seeds from the jalapeno before muddling it in the cocktail shaker!